April 18, 2003, Edmonton, Alberta, Canada. Banglautsab (Festival of Bengal) started at 7 PM, in the packed ballroom of Sheraton Grand Hotel in Edmonton, Alberta, Canada. His Highness Bill Smith, the honorable mayor of Edmonton, graced the occasion as its Chief Guest and extended a hearty welcome to everyone gathered for the first annual Bangla Utsab 2003 Festival of Bengali Performance Arts. In a statement, he said "I salute everyone involved with this festival for the time and effort you have invested in pulling together this world-class event...thank you for promoting cultural awareness and for sharing your heritage with others". The Opening Ceremony was directed by Manick Sorcar and it began with "Bengal Forever: A laser Fantasy", an animated documentary of the history of Bengal created by cutting edge technology of laser. The ten-minute show captured the milestones of Bengal's 2000 year-old history. It was then followed by "Bengal Bengal", an extravaganza of a series of nostalgic songs and dances choreographed Piya and Payal Sorcar and performed by Sorcar's troupe amidst colorful Bengal-thematic lighting patterns from state-of-the-art lighting. Sorcar is one of the handful of US animators who uses laser for moving animation. 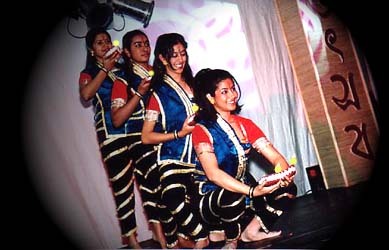 Along with “Bengal Bengal”, Sorcar’s troupe performed fusion items the following evening. The two items the troupe performed “Takita” and “Synergy” were a unique blend of dances from the East and West in combination with computer-controlled intelligent lighting. The two fusion items were sandwiched by Sorcar’s new animation "Ekushe-Aine" (Rules of Twenty One), based on a popular nonsense verse of Sukumar Ray. 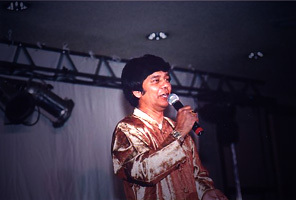 "Ekushe Aine" received unprecedented response in Kolkata during its release in December, 2002 and this was the first time it was screened in Canada. The entire program was enthusiastically received by the cheering crowd of the packed hall.